Exploring the art and practice of emerging artists through interviews, studio visits, and exhibitions. 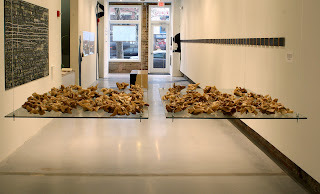 As part of the residencies each was awarded last year, artists Christian Benefiel and Leah Frankel exhibited at the Hamiltonian Gallery in Washington D.C., from January 31 through March 14, 2009. In addition to their participation at Hamiltonian, these artists shared experiences at the University of Maryland College Park, the Pyramid Atlantic Arts Center, the Washington Sculptors Group and Woodman Studios of Silver Spring. Their exhibition was an interesting example of an artistic relationship developed locally over the past few years. 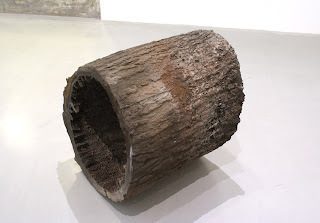 Christian Benefiel investigated natural and fabricated forms with rich textural detail, as in Oak, a formidable iron tree trunk, and in Staple/Commodity, a bread market complete with bins of cast iron bread varieties and a hanging scale. Most intriguing were the surface qualities of rusted metal objects enveloped in oil-soaked paper, as in Contemporary Relic, which evoked mummified plane wreckage exhumed from an ancient grave. Leah Frankel created a dramatic visual contrast with large distinct pieces incorporating destroyed books as their shared medium. In Dom Na Pacyfiku, dozens of separately folded, wax-covered book pages rested on two suspended glass panes, like a gaggle of encaustic origami ducklings interacting on a frozen pond. She again reconfigured the traditional confines of the written word to explore the expressive inadequacies of language in Book Contour, a six-foot mountainous horizon of shredded paperbacks. Continue to follow these artists as they participate in a number of upcoming regional exhibitions. For more information, visit their websites at www.christianbenefiel.com and www.leahhfrankel.com.